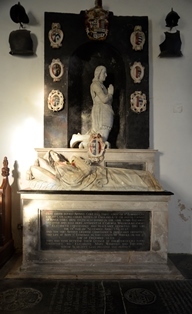 Two days ago I heard of the unexpected death of Mandy, a cellist friend with whom I visited Wenhaston church shortly before Christmas, and whom I last saw on the day of the church visits I have written about below. I first met Mandy and Nick over five years ago, after an introduction from a friend of my father’s, when we played together in the Lavenham Sinfonia. But our friendship developed more recently, and has been a hugely important part of my last two wonderful years. This has been largely due to my church project. 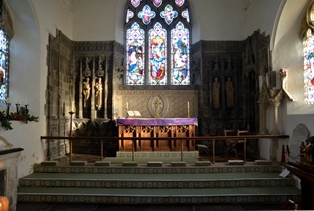 Their encouragement and enthusiasm, as well as joint church visits, have been truly wonderful aspects of my tour. Music, gardens, turtle doves, chickens, Suffolk churches, cello, baking, knitting, books and home grown fruit and veg are just some of the subjects we have chatted about. A borrowed book on my bedside table bears Mandy’s name inside the front cover. How little did I think, even three days ago when I picked it up to start reading it, how poignant a simple glance in its direction would soon become. 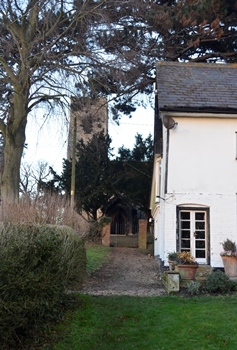 Arriving at their beautiful cottage in Sibton Green has been the closest I have felt, since my parents died, to the embrace of a safe and affectionate home where I could forget about the outside world for a while, chatting and drinking tea by the fire with a cat stretched out on my lap. My mind continues to circle round the fact of her death, half baffled, half disbelieving, unwilling to touch it and yet unable to leave it alone. And my thoughts travel constantly to her family, whose pain will be great. I am comforted that she will accompany me on the rest of my winter church visits through a very special Christmas present that arrived through the post. I couldn’t think who had sent it, or what it could be. 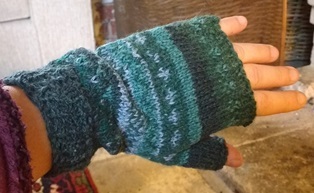 It kept me smiling for a whole morning: the package contained a pair of her beautiful hand-knitted fingerless mittens to help me play the cello in churches more comfortably through the cold months. She offered to teach me how to knit Fair Isle patterns and thumb holes, and we were planning a knitting session to cheer up the dreary month of February. I don’t know if it’s really possible to learn to accept death; perhaps learning to live with it is the best we can hope for. As far as that goes, my church tour has been helpful – a little, at least. I feel I can also turn to my cello, now, to teach me. But each new loss requires the lesson to be learnt again, from the beginning. 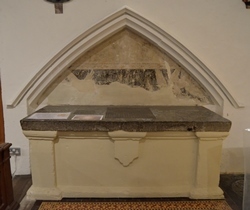 Darsham, Rushmere St Andrew, Framlingham, Cratfield, Walpole Old Chapel and Wenhaston. 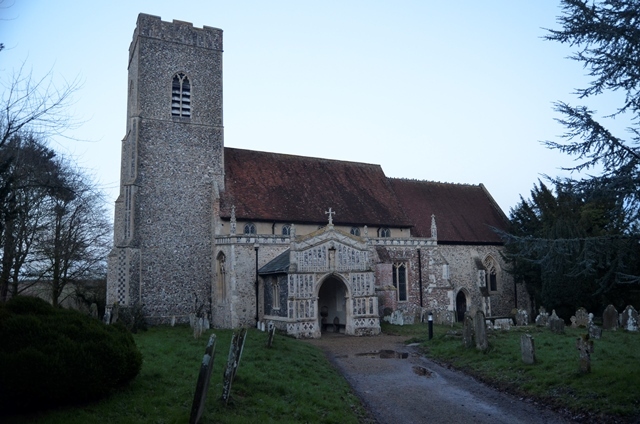 I remembered vaguely that there was something special about Bramfield church, but it wasn’t until I pulled up outside that I remembered what it was: Bramfield is the only church in Suffolk with a detached tower. 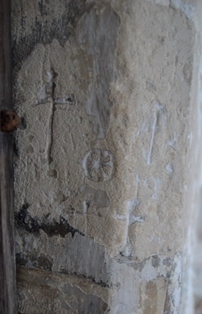 A tower which, apparently, had never been joined to the church. 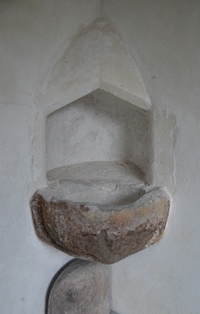 Theories as to the reason for this – and the date of its construction – vary; I am not sure if there is a definitive version of its history. 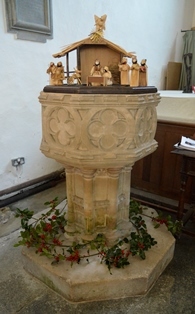 It was one of my most exciting arrivals at a church, especially on such a bright morning. Not only because of what I saw inside the churchyard, but because of what was on the opposite side of the road: perhaps the longest crinkle crankle wall I have ever seen (see header photo). This name never fails to make me laugh, and it took a while before I could remember it after my friend Mark educated me as to its identity. Consequently I have to tell him every time I see one because it amuses me so much. 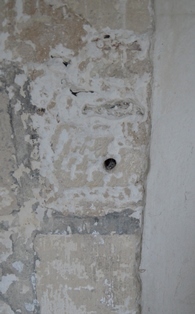 I have now discovered Bramfield’s wall probably isn’t so long after all: what is thought to be the longest crinkle crankle wall in the UK stretches for three quarters of a mile (once 2.5 miles) and is at Easton, near Wickham Market. Suffolk boasts far more such walls than anywhere else in the country. Finally I turned my attention to the original reason for my visit. The tower was beautiful. It looked like it belonged in a fairy tale – Rapunzel, perhaps. 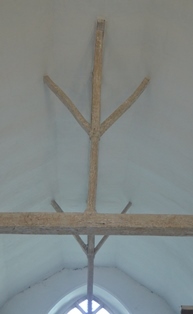 The thatched church roof was also unusual, with a pattern halfway up the thatch rather than just on the ridge. 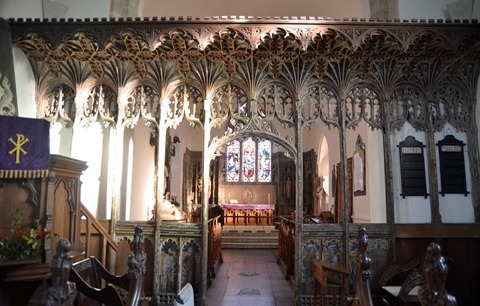 Indoors was hardly less exciting: I could see as soon as I entered that the rood screen was special: intricate woodwork combined with beautiful paintings. 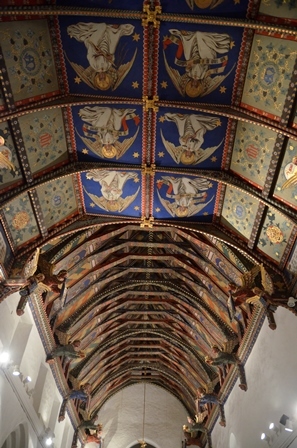 Tall, thin posts supported the nave roof: they looked more spindly than the crown posts I was used to, but, after some research, it seems that this is nevertheless what they are. 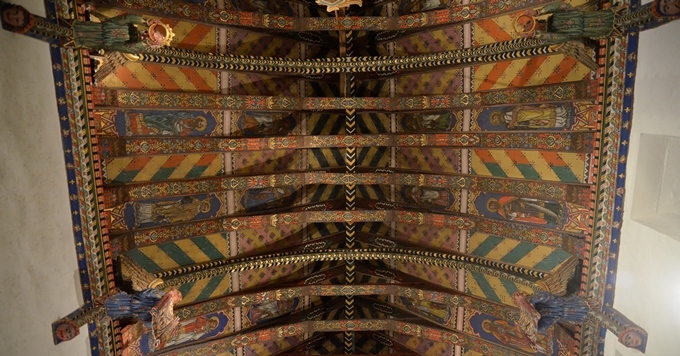 The church’s aural beauty matched its visual beauty. 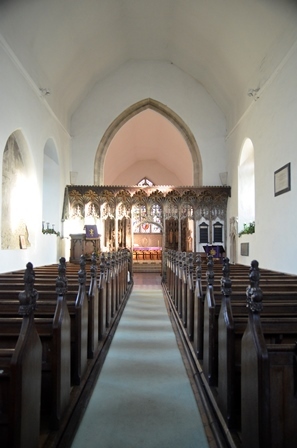 I felt thoroughly spoilt practising in Bramfield church. I wondered how the rest of my day’s church visits could possibly compete. 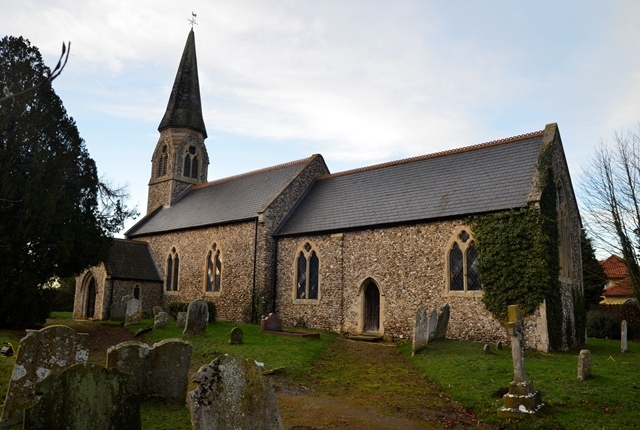 But Suffolk, especially this area around Halesworth, seems to be well-endowed with beautiful churches, so I doubted I would be disappointed. 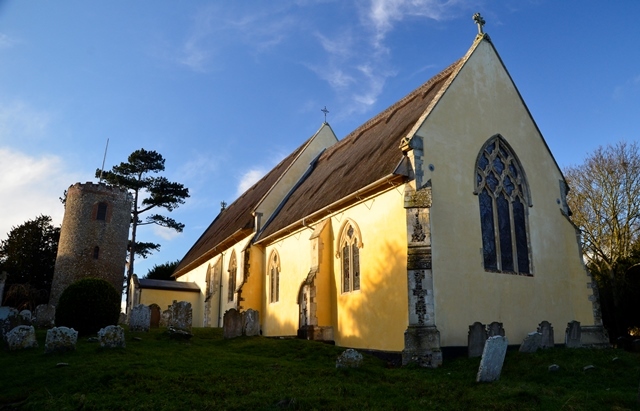 I passed Walpole church on my way to Walpole Old Chapel last spring. 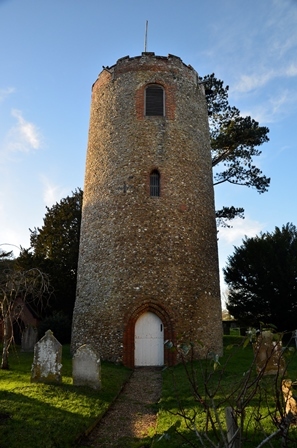 It hadn’t particularly attracted me – its tower and spire looked undoubtedly like a Victorian job – but I liked the feel of the village itself, and the church’s position on top of a hill. 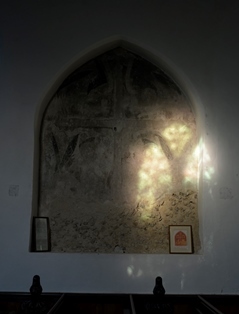 It looked as though it was on a mound – usually an indication of an ancient site – but it was hard to be sure as the hill rises so steeply towards, and beyond, the church, that it might have simply been a question of natural undulation in the hillside. 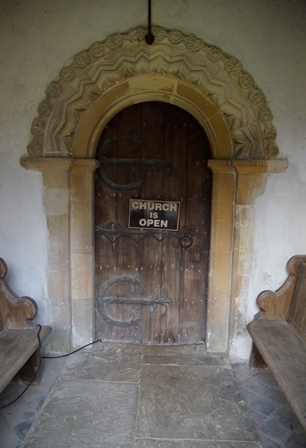 The ‘CHURCH IS OPEN’ sign immediately improved my attitude towards the church, not to mention the door to which it was attached: the Norman doorway and beautiful ironwork both gave me hope that the exterior impression the church gave would not be representative of the interior. Unfortunately this was not quite the case. 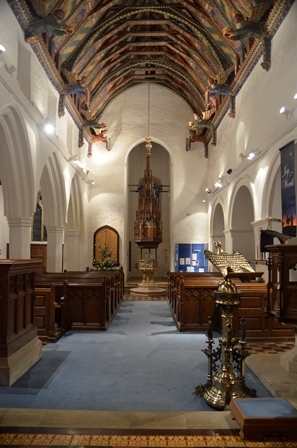 Apart from a medieval font, the interior was dark and, though by no means unpleasant, neither was it particularly inviting. 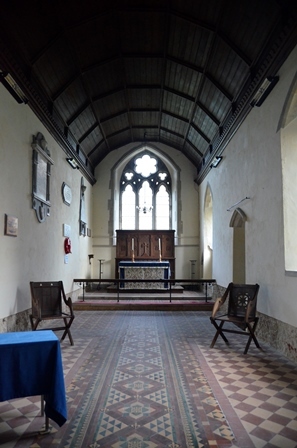 Things improved when I walked up to the chancel, however: it was lighter, and emptied of nearly all furniture. I could quite happily play the cello here, I thought. The acoustic didn’t disappoint, and I left Walpole in a far more appreciative frame of mind than I arrived. 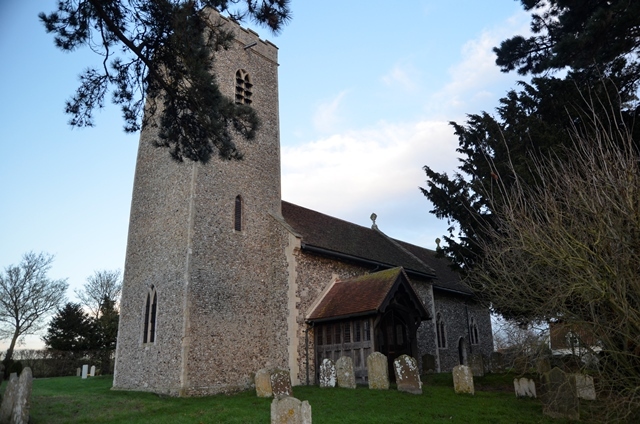 It was a pleasure to arrive at Cookley church. It was uphill from the road, behind a house, through whose garden I had to walk to reach the churchyard gate. I wasn’t sure how likely I was to find it open at this time of day, so I left everything in the car and went up to check. 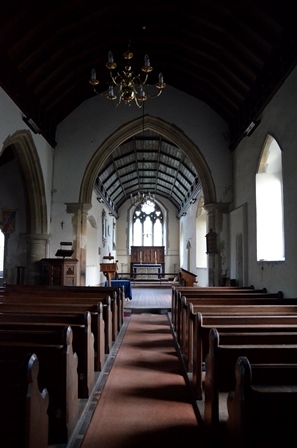 It was a tiny church with a homely feel and a lovely view across the fields. Inside I found a gentleman decorating a Christmas tree. He seemed pleased with the prospect of some music to accompany his task. 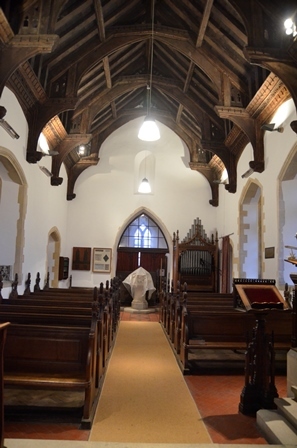 When I returned with my cello he offered to put the heating on for me; I declined, saying I didn’t want to put the church to any expense on my account. 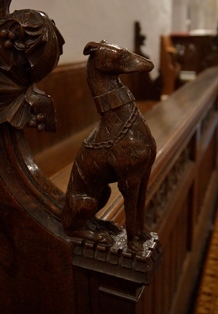 Soon, he sat down on a pew at the back to listen. I played some of the Bach suite in E flat major, in a not particularly polished fashion, having not yet dedicated much time to practising it. But I’d already started by the time it was clear he he wanted to listen, so I decided to continue. We chatted afterwards while I looked around. His wife used to be a musician, he told me, and would be delighted to hear that I’d come to play my cello. Not for the first time, my church visit was defined by a meeting. 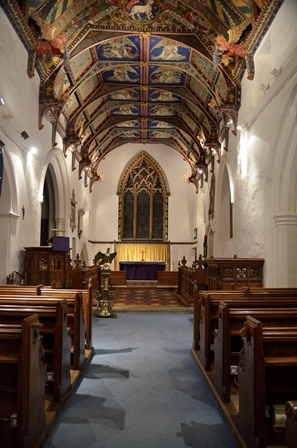 I have since learnt that I missed a couple of historical details in the church, but this hardly matters: I am happy to remember Cookley church as much, if not more, for the friendly man I met there as for the building itself. 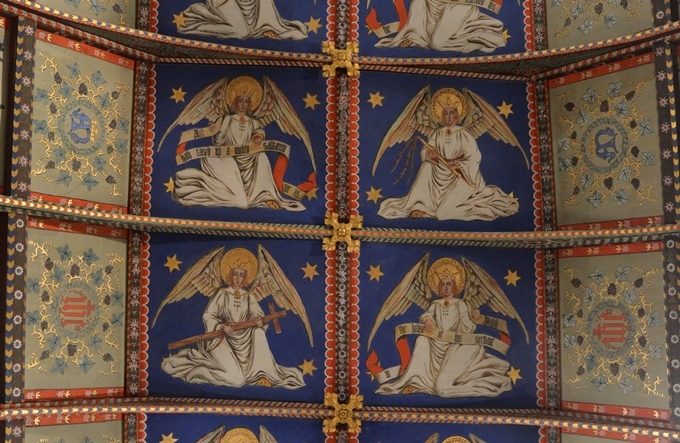 Huntingfield was another church of whose reputation I had heard, and I was looking forward to seeing inside: its roof was famously painted by the wife of a 19th century rector. A novel has even been written about it. 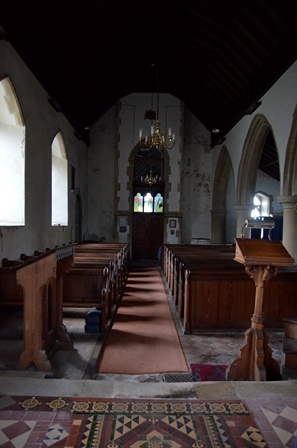 This was the first church I arrived at today with confidence that I would find it open; but, ironically, I found it locked, and read on the noticeboard that it is no longer left open. 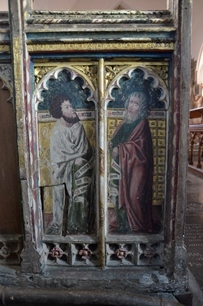 Thankfully, though, Huntingfield is in possession of a particular breed of keyholder that most other churches are not, in the form of a lady who seemed almost to be a full-time church tour guide. When I rang for the key, she insisted on coming with me, but I didn’t feel bad about this as I often do when I explained I would like to play the cello there. She was very chatty and there was no hint of reluctance in her voice. I could tell I was being taken for the full tour, one that she undertook on a regular basis; what’s more, she informed me, she was a musician too, and used to play the cello. She didn’t seem to find it at all odd that I should want to play there – the reason for which I would soon discover. I was accidentally sent on a tour round the village to find her house – she must have misunderstood which way my car was facing when she directed me. Thankfully, however, I eventually realised I was approaching from the opposite direction, and I managed to locate her house, and her waiting for me outside. As she got in the car, she told me she had read about my tour in the East Anglian Daily Times last year. I guess she had been expecting me to turn up at some point. 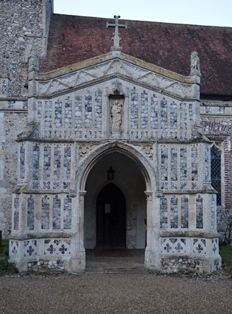 It was nearly dark by the time we went inside, but I had taken photos outside before I went to collect the key: there was plenty of interest in the flint porch, brickwork, graffiti and holy water stoup. Indoors there were lights to illuminate the roof, so the darkness didn’t matter. It was stunning. I wanted to know how long it had taken Mildred Holland, and how she did it. 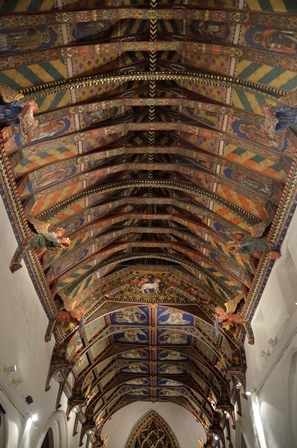 The best information I can find is that the chancel roof took 8 months (for which the church was closed) between 1859 and 1860, and the nave, the best part of three years between 1863 and 18661. Scaffolding was put up for the task. It is a story that engages the imagination, so it does not surprise me that someone felt inspired to write a novel about it. Not wanting to keep my guide waiting too long, despite her generosity, I played only one movement of a Bach suite. 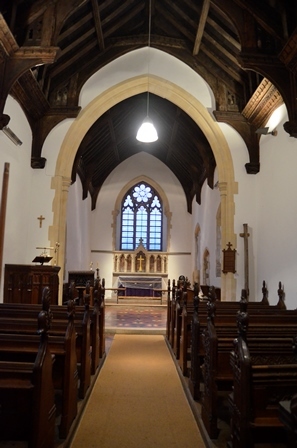 I expected little of the acoustic, what with the church’s short nave, carpeted floor and two aisles. But it wasn’t bad. I dropped her back at her house afterwards, thanked her for her hospitality, and made my way to Mandy and Nick’s house at Sibton Green where I was expected for a much-needed cup of tea: I hadn’t been able to warm up my hands all day, despite using a teabag-like hand warmer, and my feet were freezing. Tea, toasted fruit loaf and good company next to a fire were the perfect remedy.